It’s impossible not to add France on your bucket list if you’re planning to explore Europe. Whether you’re heading to Paris, one of the student-friendly cities, or the coast, you won’t be disappointed! France boasts world-famous food (yes), stunning landscapes, some of the best surf spots in Europe, romance, medieval sites and crazy nightclubs… The list of the reasons why you should visit France right now is endless. Oh actually, we missed one other MAJOR reason why you should book your trip to France right now: the cool hostels. From the heights of Montmartre in Paris, to the dreamy beach in Hossegor or the beautiful streets of Lyon, we picked the 11 best hostels in France just for you. Beautiful rooftops, cosy dorms, coolest bars & restaurants, scandi private rooms: read this hostel guide carefully, and you’ll soon get why France is a must-see. If you’re dreaming of a French gateway but are not 100% sure where to start, Paris is always a good idea. This badass hostel-loft is just what you need, especially if you’re travelling solo. In the heart of the trendy and chic 15ème arrondissement de Paris, the hostel has been fully renovated and, let me tell you, the result is mind-blowing. From the entrance to your dorm, follow the quotes on the shiny black walls. Relax in the café or on one of the cosy sofas in the lounge, meeting other travellers from around the world. Start your night at Arty Paris and head to the party spots just a few metro stations away – Montparnasse, Saint-Germain or Bastille. Like its name suggests, Slo Living Hostel is the best spot to have a little break. This beautifully designed hostel is located in the heart of Lyon, a very trendy and student friendly city. The staff members are all locals and are more than happy to give their tips and cool places to explore Lyon. You will be able to share homemade dinners at the hostel with other travellers, or relax at the bar area with a drink or two. Did we also mention that there is a super cool terrace?! You can’t go wrong if you choose to book at Les Piaules in Paris. For some of the best Parisian cityscape views head up to the hostel’s rooftop, hang out with fellow travellers in their cool bar & café, or in the modern lounge (with fire place!). If you’re having the BEST time, eat in the hostel’s restaurant, or explore the city with new friends. This is THE place to be! Whether you’re in a dorm or in a private room, you won’t have time to get bored. Not to mention that Les Piaules is located in the arty district of Belleville, where you’ll find some of the best bars and coffee shops full of young students and hipsters. Do you already feel a bit more Parisian? What about trying a hostel with your other half? You will get the super cool atmosphere you can only find in hostels, while enjoying the cosiness of a private room and hopefully some romance! You will be welcomed by a young and multilingual team ready to share all their best tips on discovering Paris like a true Parisian. After a busy day exploring the city, you’ll be happy to chill with a drink on the terrace, or in your room. The view of Montmartre and le Sacré Coeur makes it super romantic (even if you’re not a born romantic, you won’t be disappointed). Don’t forget to have a glass of wine (or two) and a cheese board with other travellers staying at the hostel to make the most of your time in beautiful Paris. Calling all coffee lovers: this hostel is for you! If you’re looking for a cosy and cute place to relax while you’re travelling with your partner, Away Hostel & Coffee Shop in Lyon is the one. You will find super cosy dorms or private rooms with Scandinavian designs, that will make you feel at home. Not to forget the best coffee shop in town, just one second away from your room. Careful, you might get totally addicted to #hygge . If you’re looking for a safe place to leave your backpack while partying the whole night, we’ve got you covered. 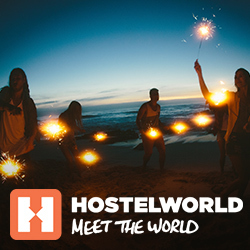 Have a look at this hostel and let’s go party! If you want to have a good time in Paris and party until the next day like a true local, head to Generator Hostel. Between the cool bar, the roof terrace with an amazing view over Montmartre (with a bar), the lounge area, the café and restaurant, you will meet travellers from every part of the world. Perfect to start the night with a few drinks at the hostel and reach the best spots near the Canal Saint-Martin. Santé! Almost too good to be true, you won’t be able to take your eyes off this cool beach hostel, located in Hossegor, South of France. Expect a super chilled vibe and an amazing garden full of hammocks, mats, cushions and sofas. There’s a massive outside bar as well. Not sure about you, but we can already picture ourselves lounging on the sand, with one or two cocktails in hand. There is also the trendiest café and restaurant, perfect to start your day (early afternoon after a big night out) the best possible way. If you’re fresh enough, you might also want to test a surf lesson out. You couldn’t be more central with these hostels – bars, clubs, restaurants, shops and sites – you will find everything just a few minutes from the hostels. Whether you’re planning to explore Lyon on a bike or by foot, Alter Hostel is the best way to feel the city’s local life, while also meeting backpackers from all parts of the globe. The hostel organises cultural and festive events, you’ll be also able to rent a bike or a kayak (it’s all about new experiences), have a few beers at the bar, all just a few minutes away from the old town and its main sites. Hostel Ozz is located only 2 minutes’ walking distance from the Nice central train station and 15 minutes’ walk from the beach (yes)! The hostel is in a fully renovated artistically designed building, vibrating around the theme of Music. It is also a short walk to the Nice Etoile Shopping Centre and Marc Chagall National Museum. It’s the perfect location to enjoy a city-break, relaxing on the beach or exploring the beautiful old town. If you’re a born traveller but you’d like to keep some privacy while exploring the world, don’t worry. These hostels have super cosy private rooms, just perfect for you. This waterfront terrace hostel on the canal, is one of the best in Paris. It’s super relaxing during the day, but don’t be fooled… This awesome hostel has the coolest bar and a club. You’ll be happy to know that you’ll receive 25% off food and get 2 for 1 drink specials all night, every night. The private rooms are just what you’ll need after a night out (or in the hostel). Have fun. Located in the famous Montmarte district, Le Regent Montmartre Hostel is just a few seconds away from le Sacré-Cœur and only a short walk from the Moulin Rouge and Pigalle. Each room is super modern and cosy. Be ready to wake-up with a magical view each morning. It’s perfect to explore the area by foot during the day and head back to the hostel to relax on the little balcony with a book or a coffee like a true Parisian. We hope the hostels we chose helps you to discover this beautiful country. Let us know in the comments if you’ve stayed in one of our recommended hostels, or if you’d like to share a hostel that you think other backpackers shouldn’t miss in France.